Click to take the Cat Language Quiz, Pt. 1 or Pt. 2! The most obvious way that cats communicate to us is through vocalization. Probably the most thought of way cats vocalize is by meowing. Cats have various meows for different needs. A short, sweet mew could be a "hello." A loud, demanding meow indicates a need, whether it be food, water, affection, or otherwise. Another vocal noise that is familiar is the purr. It is often believed that a cat only purrs when it is happy. This, however, is not true. A cat may purr to seek for care, to comfort themselves or another cat, as well as when they are content. Chattering is most likely a combination of excitement and frustration. Often, a cat will chatter when he is indoors and he sees a bird right outside the window. He is excited because of the bird, but frustrated because of his inability to reach it. 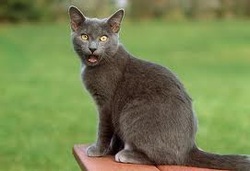 Another reason cats may chatter is that they are imitating the death bite they inflict on a captured animal to kill it. This chattering happens while looking at prey they cannot reach. Hissing, growling, and yowling are obvious signs of aggression or fright. Other ways that cats communicate is through body language. Along with the ears turning everywhere to listen, they are a good way to tell a cat's mood. If the ears are straight forward, the cat is probably alert and happy. 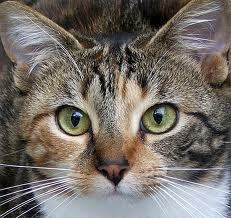 If the ears are flat back against the head, the cat is frightened or becoming aggressive. Cats pull their ears back when they get aggressive so that they won't be injured if a fight occurs. One of the biggest ways cats "talk" to us is through their tails. If the tail is straight up, the cat is happy. When it is still, the cat is alert, but content. A slight twitching at the tip of the tail indicates a slight annoyance, or a feeling of playfulness. A danger sign is when the whole tail whips back and forth rapidly. This means the cat is ready to attack. Also, overall body posture is important, such as when a cat puffs his fur up and stands tall to look larger than he is to scare an enemy. Often, you need to look at all of these parts of the body to draw an accurate conclusion. Because the cat has a large amount of scent glands on the head and face, rubbing against his owner is a way of expressing love by marking the owner as "his." If when the cat first approaches his owner, or visa versa, the tip of tail is quivering, this is one way the cat says, "I love you." Although this seems strange, cats will "knead" their owner to express their love for him. As the owner is a mother figure, cats who love their owners will knead them as a kitten kneads its mother to get milk from her.